‘Ombra della sera’, or ‘evening shadow’, is the name usually used to describe a distinctive bronze votive recovered from the region of Volterra (Etruscan Velathri, Roman Volaterrae) first exhibited in the early 18th century. 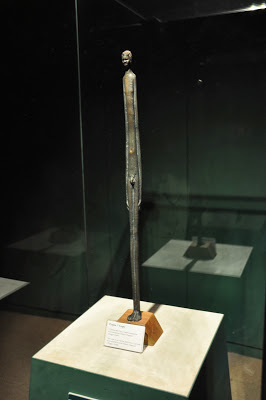 The thin, elongated figure, made during the 3rd century BC, is most well-known for inspiring the work of the Swiss artist Alberto Giacometti. It is by no means the only votive of this type and several others from this region of ancient Etruria adopt a similarly ‘stretched’ form. They do indeed resemble shadows, particularly those which undulate slightly as if replicating the manner in which a human silhouette falls on uneven ground. 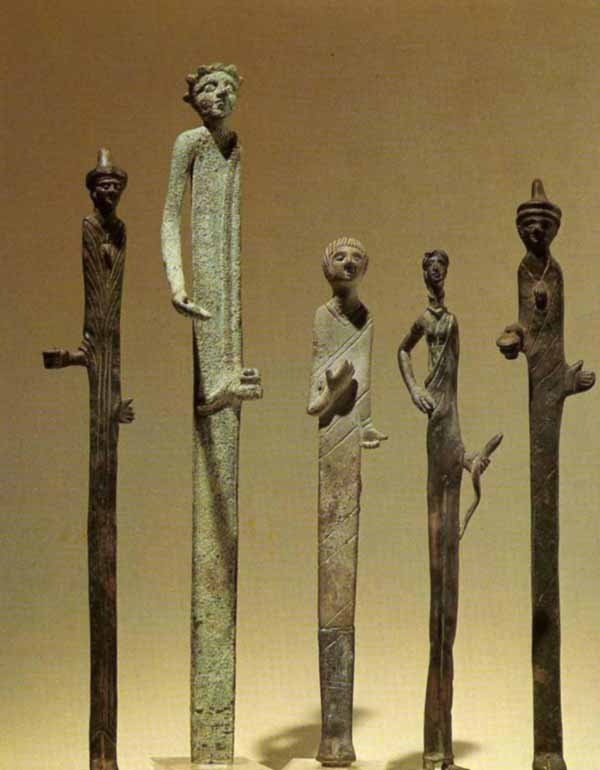 In his volume on ‘Etruscan Art’ (1997) Nigel Spivey suggests that the form of these votives might be explained by the need to ‘catch the attention’ of the presiding deity, with the ability to ‘rise tall above the other statuettes’ offering a simple, and definitely rather elegant, solution. But that does not explain why the same didn’t happen at other sites where competition for the attention of the god must have been equally as strong. Sybille Haynes (2000), on the other hand, has proposed that the form of the figure harks back to an older tradition of wooden and sheet metal ex-votos. But what if there is more to the popular modern appellation for this votive and those which may be related to it? It certainly does look like a shadow cast on not completely level ground, at around dusk or indeed around dawn (although perhaps evening seemed more evocative to those who first described it), and shadows, as well as reflective pools liable to similar forms of distortion, were presumably the only ways in which any ancient person ever saw their own complete body shape before the development of the full-length mirror. If offerings were indeed intended to represent the dedicants themselves was this a means of visually reproducing bodily appearance based on one’s personal knowledge and experience of it? Was evening (or, for that matter first thing in the morning) a particularly important time for ritual acts and making offerings? Were these the sorts of shadows that were cast when people made offerings? Were these in fact the types of ‘bodies’ that they associated with their communications with the divine? The body is elongated, but the head looks more like it is in regular proportions. So perhaps the head is conceived of differently to the body? Maybe it was necessary for the head to be recognisable rather than elongated. In any case it is interesting that different ‘stylisation’ is used on different parts of the figurines. Interesting point Phil. I have often wondered about the significance of the head. Some terracotta votives single the head out for attention (heads and half heads) and despite arguments that bronze mirrors allowed people to view their own bodies – Izzet 2007, p.121: ‘a mechanism for the manipulation of the body’ – really they could only show the head/face. And, what is more, by doing so they also effectively separated the head from the rest of the body. Where can you see these works in collections? Are they primarily in Italy, and if so where? The one in the first picture can be found in the Guarnacci Museum in Volterra, Italy. See: http://www.comune.volterra.pi.it/english/museiit/metru.html There are also several of the elongated figures similar to those in the second image in the Museo Nazionale di Villa Giulia in Rome. You can see some on their webpage here: http://www.villagiulia.beniculturali.it/index.php?it/144/i-bronzi In fact, I can highly recommend the whole museum!